Ministry of Toys advice for parents and young children: 1, Do not put hands into mouth of shark. 2, Do not encourage shark into bathing area. 3, Do not take selfie with shark. 4, Do not pet shark. 5, Do not throw peanuts, fish, live monkeys or hamburgers at shark. Above all, treat with respect and remember you are the visitor in the world of shark. Masters of the Universe. 1986. Italy. I have an awesome bed! Big Jim. Dr Steel. 1970s. France. Six Million Dollar Man. 1977. France. TSR. 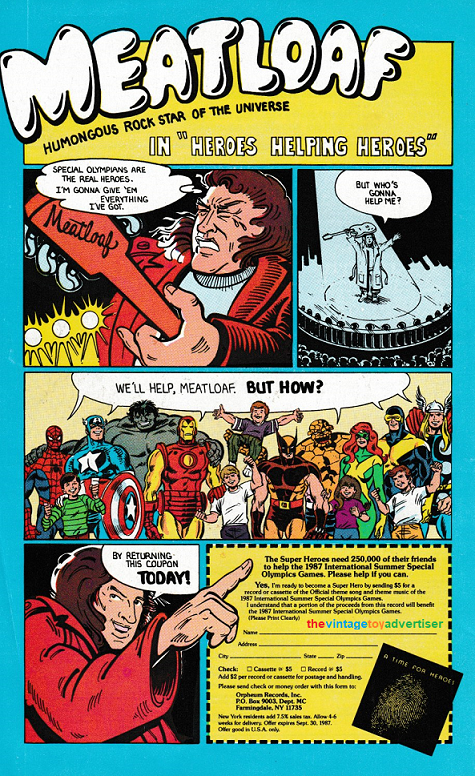 Marvel RPGs. 1988. Strange Tales. US. Remember – beware of the shark! Petra / Lotte dolls. 1978. Denmark. Cover for Télé Parade Mensuel N°6. 1978 featuring Jabberjaw and Scooby-Doo. This entry was posted in Latest ads and tagged Big Jim, Darda demon, G.I. Joe, Jabberjaw, Jaws game, Lotte dolls, Miniamil, Petra Dolls, Plaster Casters, Predator BMX, SCALEXTRIC, sharks, Six Million Dollar Man toys, Sketch Master, Solido Bati 1000, toy advertisements, toys, Trik-Trak, vintage toys on December 17, 2018 by The Vintage Toy Advertiser. Wow, she said, what freshness! Minty, flashes of taste! Let’s dance! TSR Endless Quest Books. 1984. US. TSR Gamma Raiders. 1987. US. TSR Codename Spitfire. 1987. US. Matchbox various die cast. 1970s. France. Baseball Trading Cards. 1990. US. 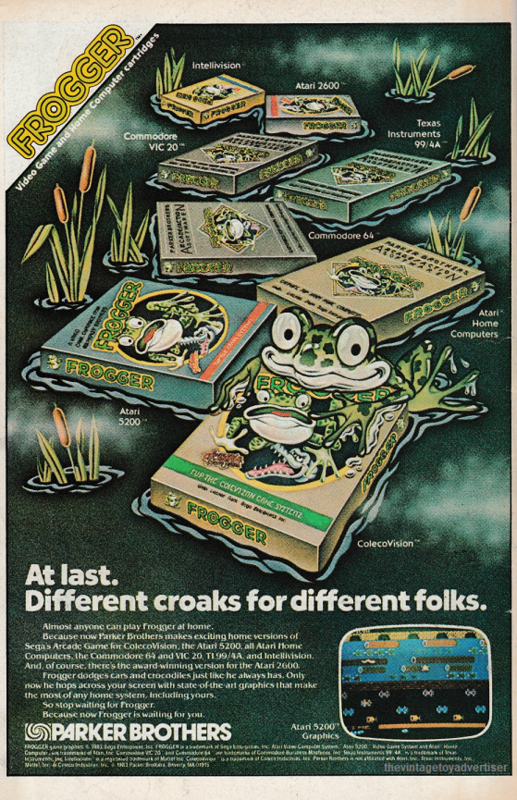 This entry was posted in Latest ads and tagged nostalgia, pop culture, print adverts, retro, vintage advertisements, vintage advertising, vintage toys on November 16, 2018 by The Vintage Toy Advertiser. 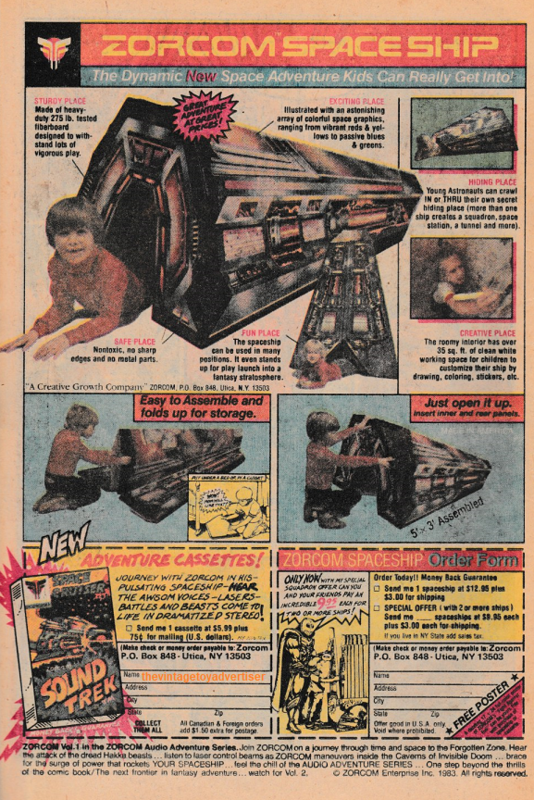 The weekend kicks off at TVTA with an 80s mix of ads for model kits, 007 role playing games, My Little Pony, Oodles, Playmobil, Dungeons & Dragons and Columbia BMX. MPC The Empire Strikes Back. Spider-Man N°14. 1981. US. MPC Return of the Jedi. House of Mystery. 1983. US. Masters of the Universe. Amethyst. 1984. US. MPC sweepstakes. Alpha Flight N°5. 1983. US. MPC. The Invincible Iron Man N°129. 1979. US. MPC Body Builder. The Young All-Stars N°9. 1988. US. Revell Magic Glo Racers. Alpha Flight N°8. 1984. US. Revell. De Speelboom N°3. 1987. Netherlands. 007 Victory Games. Alpha Flight N°5. 1983. US. 007 Victory Games. The Incredible Hulk N°292. 1984. US. My Little Pony. De Speelboom N°3. 1987. Netherlands. My Little Pony. Speelboom Club Journal N°3. 1986. Netherlands. My Little Pony. Intertoys Speelboek 1987 Autumn Catalogue. Netherlands. Oodles. Speelboom Club Journal N°4. 1987. Netherlands. Playmobil. Intertoys Speelboek 1987. Netherlands. The Adventure Is Yours. The Defenders. 1982. US. A D&D Adventure. Ghost Rider N°68. 1982. US. A D&D adventure. The Thing and Sub Mariner N°81. 1981. US. D&D Gazeteer. The New Mutants N°57. 1987. US. 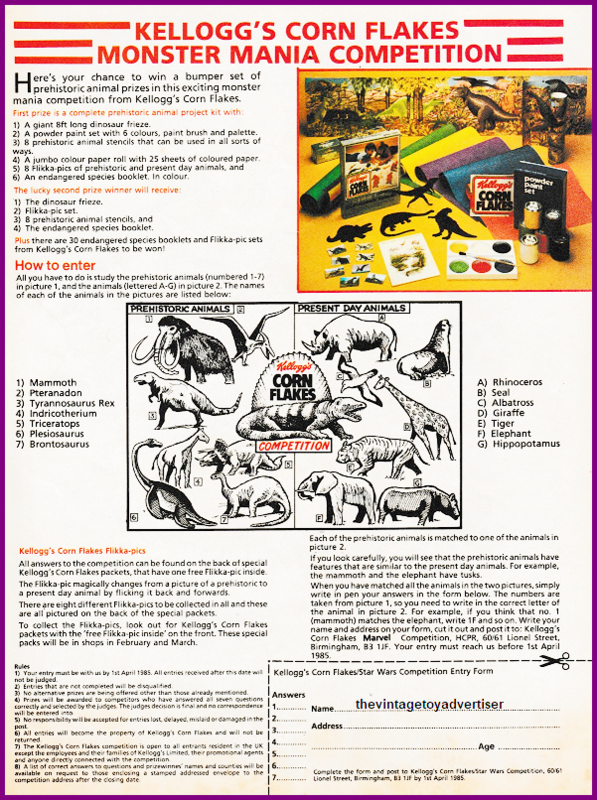 This entry was posted in Latest ads and tagged 1980s, 1980s model kits, Columbia BMX, Dungeons & Dragons 1980s, James Bond, Latest ads, My Little Pony, Oodles toy babies, pop culture, retro adverts, Star Wars MPC model kits, toys, vintage toy advertisements, vintage toy adverts, vintage toys on October 13, 2018 by The Vintage Toy Advertiser. The New Mutants N°24. 1985. US. Conan the Barbarian. The Scarlet Personage. 1985. Owsley, Buscema, Chan, Chiang, Roussos. So thank goodness for Punch ‘n Juicy Soft Bubble Gum – the big juicy taste in my favourite flavours! Yay, Very Cherry! Punch ‘n Juicy. The Thing N°6. 1983. US. M&M’s. The New Mutants N°57. 1987. US. M&M’s. Blue Beetle. 1986. US. Going for orange. “Glubgrafutz” Reese’s Pieces! Reeses Pieces. The Incredible Hulk N°311. 1985. US. Striped Chips Ahoy. The Young All-Stars N°9. 1988. Coke. The Young All-Stars N°9. 1988. Okay, fine, but what about the toys? … all these sugary vintage snacks are giving us toothache! Téléphérique toy. Jouets Mont Blanc. France. 1969. Hm. Do you have anything a little more exciting than that? 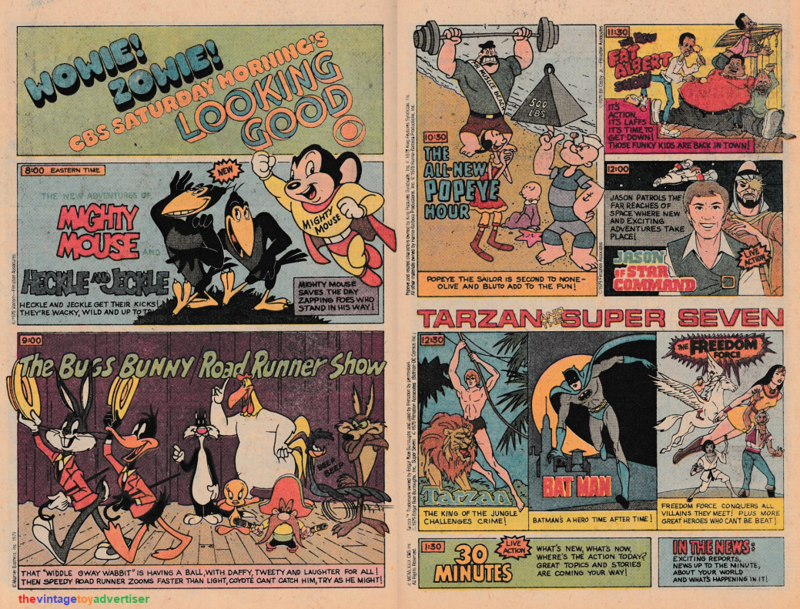 Fabulous secret powers were revealed to TVTA when… wait, hang on, these ads are fake news! Legit, not. Surely some kind of 80s MOTU bootleg knockoff thing going on! Mighty Laser Lite Sword 1986 and Mighty Force Weapons Set 1987. Netherlands. MOTU. Intertoys Speelboek 1987 Autumn Catalogue. Netherlands. We mentioned cookies earlier didn’t we? Cookie Monster Piano. FAO Schwartz. 1980-81. US. Be tough. The Incredible Hulk N°318. 1986. US. Hard stuff. 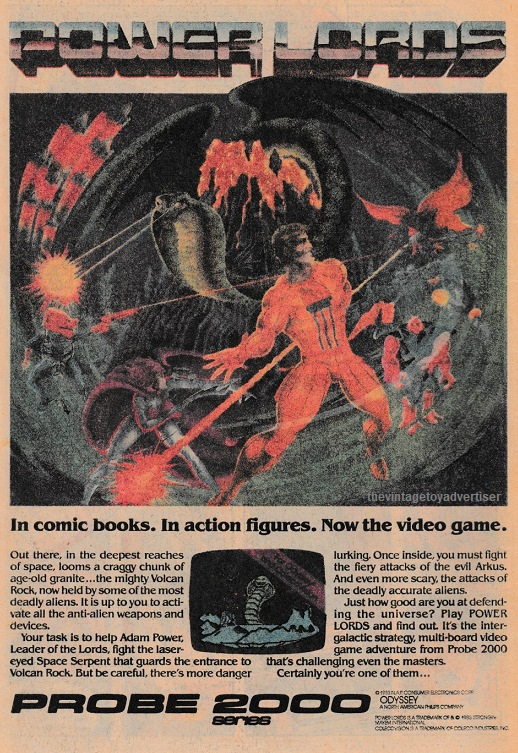 Sega Burning Rangers, what’s not to love about this ad? Playmobil. Intertoys Speelboek. 1987. Netherlands. 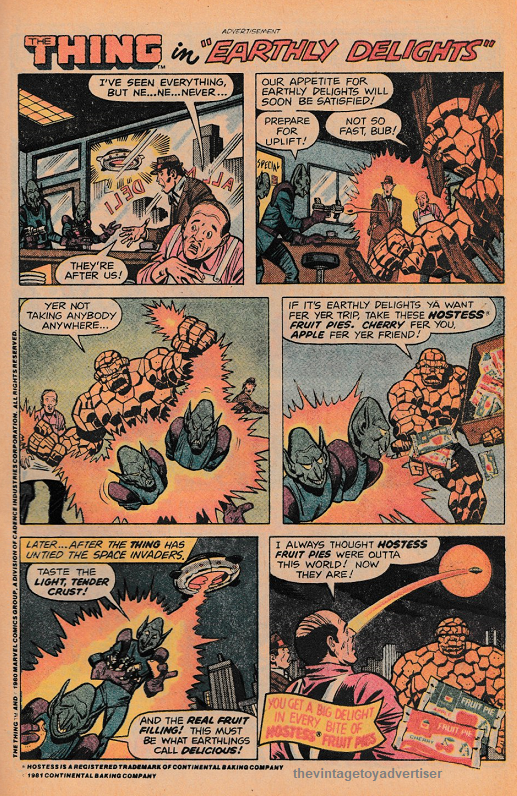 This entry was posted in Latest ads and tagged Alien eye creature toy, chocolate, Cookie Monster piano, pop culture, Punch n juicy, retro, toys, vintage ads, vintage advertising, vintage toys, weekend on October 5, 2018 by The Vintage Toy Advertiser. 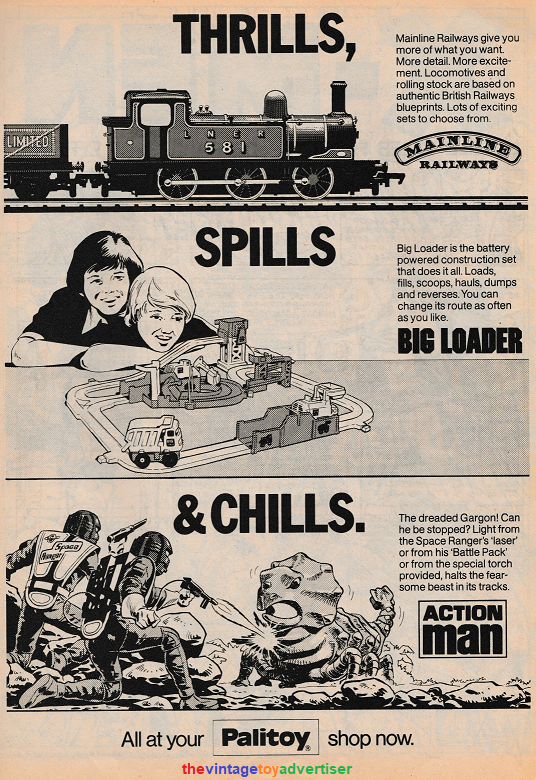 This entry was posted in Latest ads and tagged CBS Saturday Mornings, comic book adverts, Kellogg's Corn Flakes dinosaurs monster mania, Lone Ranger toys Western town, Meatloaf a time for heroes, Palitoy Big Loader, Palitoy Mainline Railways, pop culture, Power Lords video game, retro, TVTA, vintage ads, vintage toy advertisements, vintage toy adverts, vintage toys, Zorcom Space Ship on September 19, 2018 by The Vintage Toy Advertiser.